NHT Global’s Omega 3 Essential Fatty Acids is extracted from high quality fish and made in the USA. Each serving contains 600mg of EPA and 400mg of DHA, which is prescription potency. EPA is vital to cardiovascular health, while DHA is an important component of the brain and retina in fetal development. According to the FDA, supportive, but not conclusive, research shows that consumption of EPA and DHA omega-3 fatty acids supports healthy heart function. The FDA recommends a daily intake of up to 2000 mg of Omega-3 fish oil from supplements. Specialized production techniques and a proprietary antioxidant blend are used to protect the oils from oxidization. This product is natural lemon & lime flavor and tested for more than 240 potential contaminants. Quality and safety guaranteed! It is commonly believed that ‘fats’ are scary. In reality, fats can be classified into ‘good fats’ and ‘bad fats’. Consumption of ‘good fats’ is essential to the optimal function of vital bodily systems. Fats found in various sources of food can be broken down into different types of fatty acids in the body. Among those, Omega-3 fatty acids are essential fatty acids and also the component of cell membranes. However, these fatty acids cannot be made by the body and must be obtained through food. In recent years, many studies have proven the importance of Omega-3s to human health. Lacking these essential acids could lead to fatigue, dry skin, fragile nails and hair, constipation, depression, weak joints, difficulty to focus and other symptoms. 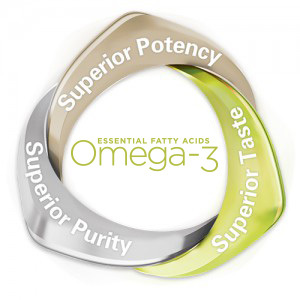 NHT Global’s Omega 3 Essential Fatty Acids are extracted from high quality fish and made in the USA. Each serving contains 600mg of EPA and 400mg of DHA, which is prescription potency. EPA is vital to cardiovascular health, while DHA is an important component of the brain and retina in fetal development. According to the FDA, supportive, but not conclusive, research shows that consumption of EPA and DHA omega-3 fatty acids supports healthy heart function*. The FDA recommends a daily intake of up to 2000 mg of Omega-3 fish oil from supplements. The fish oil used in NHT Global’s Omega-3 Essential Fatty Acids comes from sustainable sources that meet the strict certification standards of Friends of the Sea (FOS), an international organization dedicated to the conservation of marine habitats around the world. Consult your healthcare professional before use, if pregnant or lactating, suspect a medical condition, or are taking prescription drugs. Do not consume if you have a sensitivity or allergy to fish. Adults: Take 2 soft gels daily, preferably 10 minutes before a meal. Children 4+: One soft gel daily. We’d be happy to help you. Please let us know the best way to send you information on NHT Global’s Omega-3 Fatty Acids.